Excavating Mitcham was part of the Outer London Fund ‘OneMitcham’ public realm improvement project. The aim of the project was to rejuvenate public spaces in Mitcham, to strengthen the identity of the town, and to inspire a sense of pride and ownership in the citizens. On reflection of the theme “Excavating Mitcham”, our approach to the brief centred on unearthing the visual and oral identity of the local area. Our aim was to create a design that works as a metaphor for sediments of earth and layers of time. 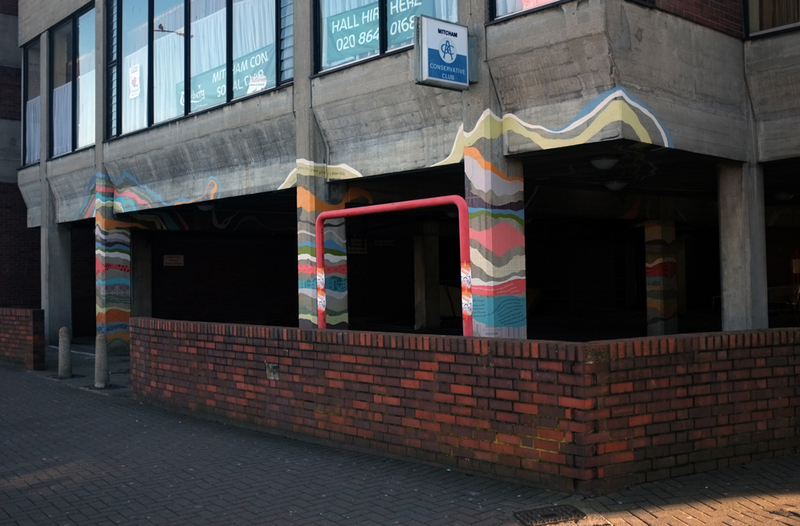 Visually playing on the idea that the car park has been dug out of the ground, excavated, the piece covers layers of local and personal histories, creating an instantly recognisable visual link between the undercroft of the car park and the natural formations of sedimentary rock. Capturing the stories, thoughts and feelings of the community, past and present, we combined typography with a varied selection of visual discoveries. From the pattern of a cricket score card, to a symbol found on a locally important building or a childhood memory of a resident, we created a rich visual tapestry of the surrounding area and the people who live there, collecting memories and traces of the past and uncovering them layer by layer. Working with lighting designers Studio Dekka, we decided to use circular lights that allow the painted layers to circle around them, enhancing the organic nature of the piece and supporting the overall concept of rock sediments. 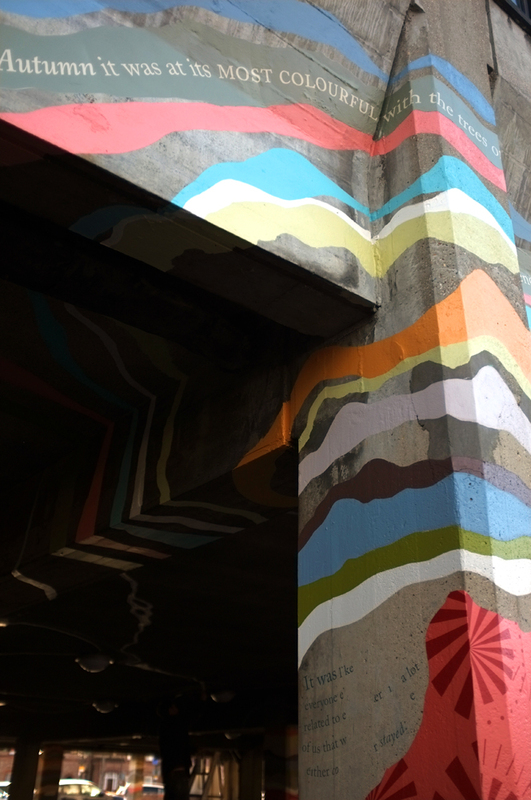 Using the texture of the concrete to our advantage, the patterns, type and bold colours blend into the surface of the concrete and the adjacent hand-painted layers. 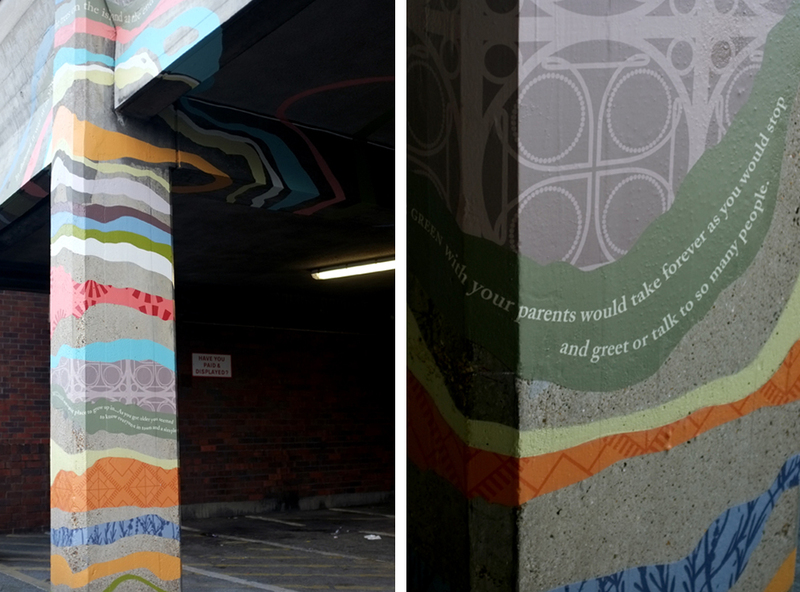 Painted layers extend and link the designs throughout the carpark, taking the viewer on journey and working its way through from one side to the other, connecting colour, pattern, memory and light.